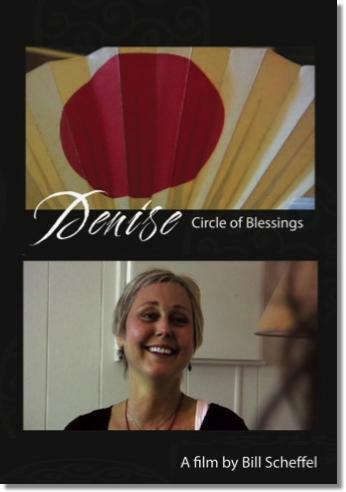 Denise: Circle of Blessing is a 60 minute documentary (the first seven minutes of the film are shown here) about the last three months of Denise Thornton's life. At age 49, Denise was diagnosed with stage-four, metastasized cancer. During the remaining three years of her life, Denise not only defied her initial prognosis of six months to live, but embraced her illness as a spiritual path and as a way of sharing her life with others. A brave and charismatic woman, Denise was a unique individual with much to teach us about our own lives. View the entire film online. This next pair of videos were filmed on a trip I made to New Orleans durng the Deepwater Horizon Gulf oil spill catastophe of 2010. I wanted to see firsthand what people were feeling and thinking during the crises and so I walked the length of the city, encountering people on the street and asking them questions about water, ecology and our future. 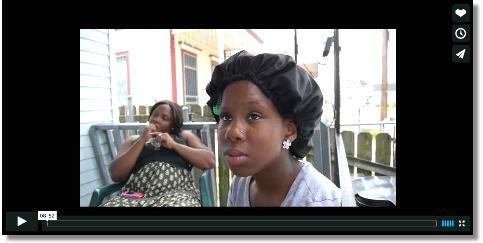 Two young residents of the Ninth Ward in New Orleans discuss their lives, living in New Orleans and the effect of the BP Deepwater Horizon oil spill-catastrophe. 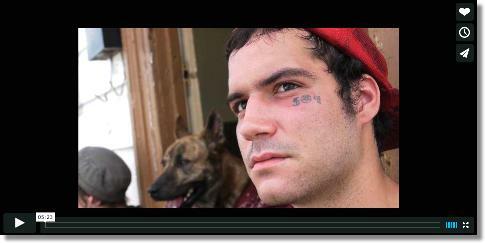 This nine-minute film comprises four interviews I shot in New Orleans, approximately four weeks after the Deepwater Horizon explosion and just as the oil was beginning to contact the Louisiana coast. These were random encounters, people I approached on the long walks I too there, mostly in the Ninth Ward. I asked questions about water issues, our relationship to our environment and, of course, about the oil catastrophe. 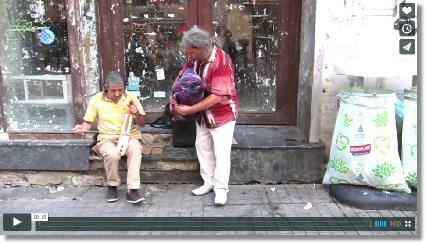 An homage to various street musicians I came upon during countless walks along Istiklal Cadessi, the historic and perpetually popular grand boulevard of Beyolu district. This is also an homage to Istanbul, the city and place, which for me is the - or at least a - "center of the world." The film an homage to the sky - always changing - the wind, seagulls, ferry boats, and the vestigial history of three world empires. The opening and closing scenes are shot in the popular tourist destination the Cistern, built in the 6th Century by the Byzantine emperor Justinian. 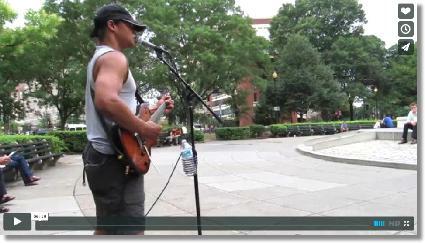 In the spirit of bliss, I offer this six-minute video tribute to three artists, street musicians I encountered in Washington D.C. and New York City. The first two musicians are high-energy and magnetic in the way the best street players are, and the third is a huge musician, of truly titanic proportions. Alice Scheffel was my mother. She died at age niney-one of liver cancer and I was her primary care giver during her last five months of life, December 2007 to April 2008. 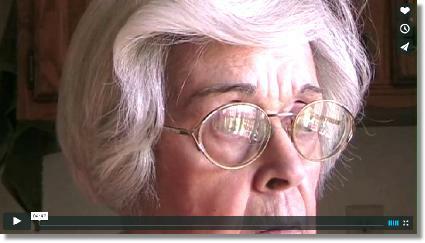 During this time I video-documented my mother's life, the things she had to say and her interactions with others. The footage in this scene was taken as I asked my mother the question, "Do you miss going out into nature?" 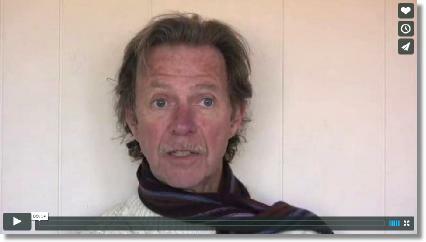 Tom is an early student of Chogyam Trungpa and has been a rolfer nearly as long. Tom has been continuously plummeting the cataract of discovery of our "inner body." I produced this film in 2007 following a series of life changing trips to Cambodia. It is an homage to the country and a devotional tribute to Chögyam Trungpa - or Lord Mukpo - whose Shambhala teachings I found reflected in the culture of Cambodia. View the entire film online. Also, see my Cambodia writings. An index to the writing and video works found on this website.